Just Amazon Message us your color choices or we will send you our best sellers! Easy.. Tons of Awesome Colors to choose from: Solid Black, Solid Orange, Solid Maroon, Solid Green, Solid Blue, Solid Yellow, Solid Red, Solid Purple, Solid Teal, Solid White, Solid Gray, Solid Brown The Hottest Hair Accessory for Every Girl! 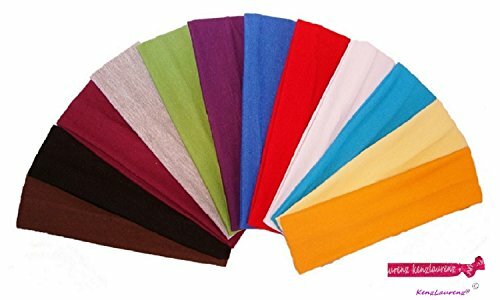 2" Cotton Stretch Sports and Fashion Headbands by Kenz Laurenz® Show your Spirit! ... Great for Yoga, softball, basketball, soccer, track, golf, tennis, volleyball, cheer, pom, dance, gymnastics, skating, bowling, badminton or any other athletic team! Great for young athletes and women. One size fits most... Used while running, working out, yoga, and more!! If you have any questions about this product by Kenz Laurenz, contact us by completing and submitting the form below. If you are looking for a specif part number, please include it with your message.